When this city-fied girl agreed to marry The Hubs, I also unknowingly signed up for camp cook. Truth is, he's a man that likes to camp. And by camp, I mean IN A TENT with nothin' but a sleeping bag and a back pack to serve as amenities. Over the years, I've convinced him that THIS GIRL needs a little bit of luxury...like say a bar of soap and a toothbrush. But, he's still pretty firm on THE TENT. No campers or trailers allowed. What we can't haul on our backs or in a small cart gets left behind. Although we do own a propane camp stove, we rarely ever use it and prefer to make all our meals over the campfire. 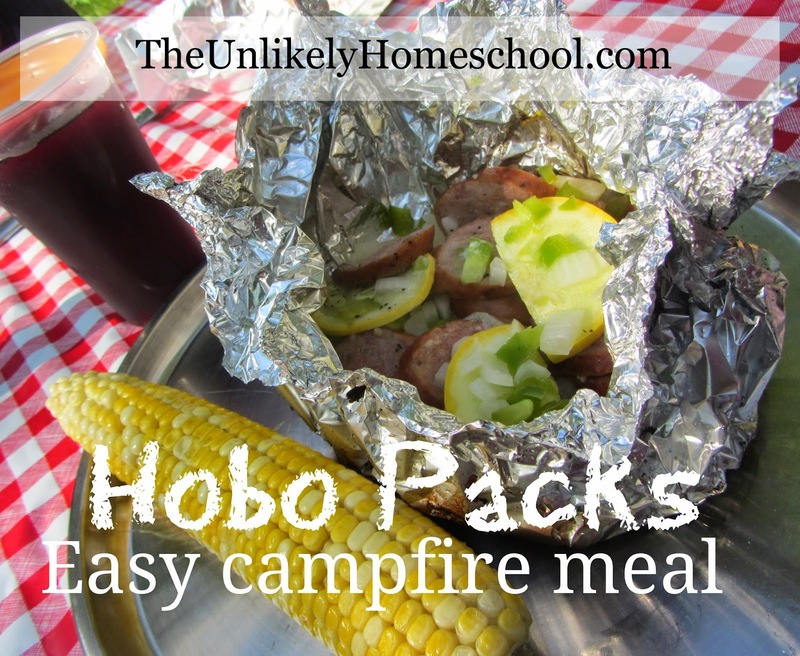 One of our favorite over-the-fire meals is HOBO PACKS. It's not only a meal, it's also a camping experience! Small confessional: I rarely ever measure ANYTHING in the kitchen except when I bake. When we are camping, my cooking can be summed up with "a handful of this" and a "dash of that". Please excuse the lack of specific measurements here. Just know that this meal is IMPOSSIBLE to mess up. Just cut up a bunch of stuff, toss it together with a bunch of other stuff, and chuck the whole thing into the fire! and Voila'...a hot, delicious meal in minutes! Seriously. But, for the rule followers among us, here is my best attempt at a "recipe." Start by cutting the sausage into angled disks. Then, chop all your veggies. I like to put each ingredient out buffet style so that each eater can prepare his/her own HOBO PACK with as much or as little of each as he/she prefers. Cut lengths of tin foil for each eater. (Approximately 1 to 1 1/4 feet of foil for each) Using a paper towel or basting brush, cover the center of each foil sheet with butter. Pile all your preferred ingredients into the center of the foil and season with salt and pepper to taste. Place one pat of butter on top of the pile. Bring the tin foil sides together to form a cup-shape. Then pour a few tablespoons to 1/4 cup of water into each foil pack. Pinch the sides shut and spin the pack to make a Hershey's Kiss-shaped point. You will use this point as a handle to lift the pack in and out of the fire. After about 20 minutes, lift one pack out of the campfire and open slightly to check for tender veggies. (BE CAREFUL! Steam will no doubt burst out of the pack. Be sure to open it away from your face.) If the veggies are not to your desired tenderness, toss the pack back into the fire pit for a few more minutes. Otherwise, open them all up and enjoy! For more campfire recipes and ideas for kid-friendly camping, be sure to visit my Camping With Kids Pinterest board. I love having these while were camping! It's a nice switch from hotdogs. Plus it's easy enough for the kids to help too! Yes. It is definitely an experience kind of meal. Everyone gets to pitch in and cook camp food.